John does Trig to determine when enemy Apes in two groups will be in firing range! On Monday, Nov. 24th, we ran a game from 1pm to about 9:45pm. A great time was had by all! The mystery of the Wheel of Time was unraveled. 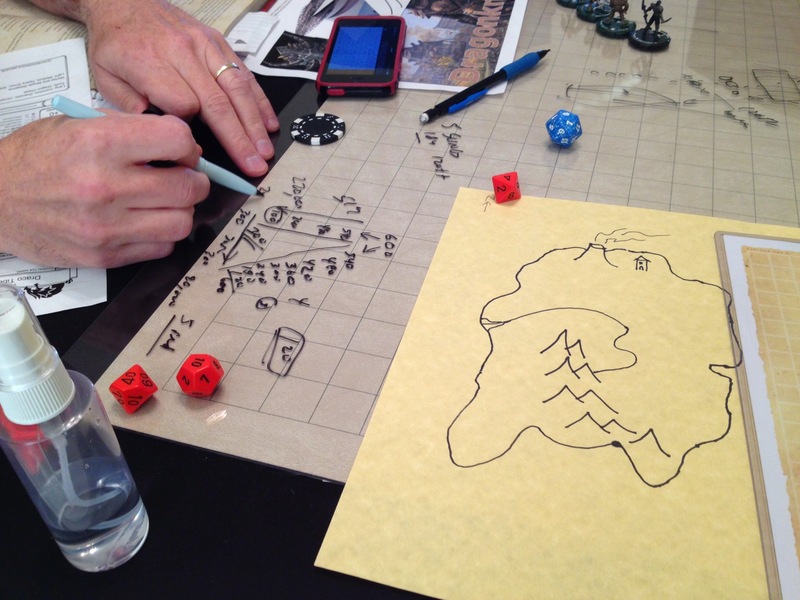 Players survived a shipwreck, killed a bunch of intelligent apes (though a few juveniles escaped), evaded a gargantuan T-Rex, survived the mind games of siren-like lamprey men, puzzled through a few magic relics, and saved some castaways. Experience: Each player present received 625 XP for defeating monsters, and another 100 XP for great roleplaying. Treasure: Each received 500 gp reward for solving the mystery. Also, you have the gold and ivory Lyre and special Glove of Loring the Lost. Neither are magical but both are historical treasures.